Innsbrook's Golf Course offers a challenging course that is fun for all levels of play and our villas and condominiums provide the living space golfers crave after a great day out on the links. Our vacation staff can customize a golf and accommodations package to suit your needs. 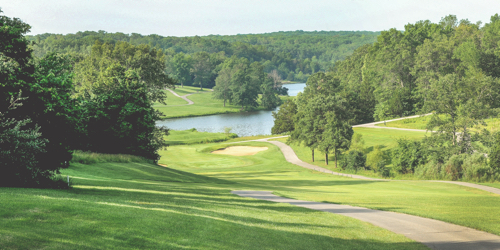 Innsbrook's 18-hole public championship golf course is carved out of the rolling wooded hillsides of eastern Missouri. It offers dramatic elevation changes and scenic views, challenging low handicappers from the back tees as well as high handicappers and ladies from the forward tees. Our condos are located on the shores of 150-acre Lake Aspen. Each is uniquely decorated and equipped with a living and dining area, fully furnished kitchen with microwave, coffeemaker and supplies, fireplace, outdoor deck, cable tv, WiFi and complimentary parking. Innsbrook Resort & Conference Center reserves the right to change price and offer at anytime. Prices and offer are subject to change without notice. GolfMissouri.com is not responsible for errors posted in this golf package.